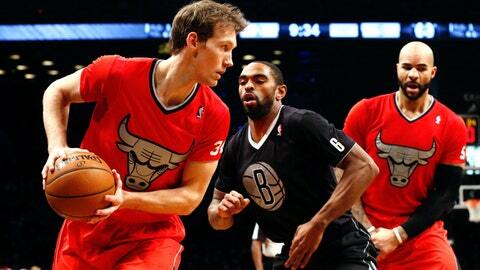 The Bulls and Nets wore some interesting uniforms on Christmas Day. The NBA offered up a Christmas treat for its fans — new jerseys! The players in Wednesday’s five games are wearing uniform tops that feature sleeves. We’ll be checking Twitter to see how they are received. Dallas Mavericks star Dirk Nowitzki checked in during the Chicago Bulls-Brooklyn Nets game and he was less than enamored. Call me old school but these jerseys with sleeves are awful…..
Wow, these NBA jerseys are just hideous. Yuck. These NBA Christmas jerseys have ruined Christmas. Crocs, Shapeups and Sleeved Jerseys.